Near-shore construction projects can take forever. Design, environmental studies, permitting, building, and unforeseen circumstances, create a labyrinth worthy of any Minotaur. In Washington State, the permit process alone for an overwater structure, such as a dock, deck, bridge, or building, can take upwards of two years. The Northwest Maritime Center in Port Townsend, Wash., received the permits to rebuild a derelict oil terminal in less than half that time by employing an approach called net ecosystem improvement (NEI). It is a strategy that could work for many environmentally sensitive projects. Developed by a group from Pacific Northwest National Laboratory's (PNNL) Marine Research Operations in Sequim, Wash., and led by marine scientist Dr. Ronald Thom, the NEI approach aims to "implement the inevitable development of nonpristine areas in a way that results in a net improvement of the ecosystem over its current condition." According to Thom, NEI is an integration of applied science to understand the issues, education, incentives, empirical data, cumulative impact analysis, and adaptive management. The latter provides a framework for learning by doing, in which a project is monitored over time to determine the success or failure of different restoration techniques and to make any necessary changes. Successful implementation of NEI depends on two major elements: broad regulator, community, and scientific involvement in project planning, and the use of environmental restoration science in project implementation. "Because the option of net ecosystem improvement is often more costly than alternatives such as no net loss, commitment by the local or regional community to this approach is essential," Thom wrote in the March 2005 issue of the journal Restoration Ecology. 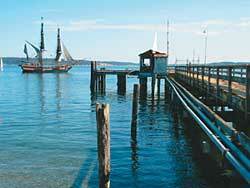 The importance of partnership on the Port Townsend project cannot be overstated. The design team included representatives from the National Oceanic and Atmospheric Administration (NOAA) Fisheries, the Washington Department of Ecology, the Washington Department of Fish and Wildlife, the U.S. Army Corps of Engineers, and the city of Port Townsend. That group teamed with scientists from PNNL, architects from Seattle's Miller/Hull Partnership, and engineers from the Seattle office of PND Inc. The 12-member group also included local educators and the dock's end users. The team met five times over six months to scrutinize permitting requirements and the latest marine research and to design a dock that met the needs of both fish and the coastal community. The result: an environmentally sensitive dock that has received community buy-in and national recognition. Docks typically harm near-shore marine life. However, much coastal development occurs in already degraded areas, offering an opportunity to remediate contamination, or even to restore ecological processes. Completed in May 2004, the Northwest Maritime Center dock fosters a vibrant human community above the water and a healthy near-shore marine community below. One of the keys to success was marrying architecture and engineering with ecological sciences. Early in the design process, PNNL scientists inserted information about environmental conditions at the site and the ecological effects of various materials technologies, so, once the design was finalized, there were no surprises during permit review. The 1930s-era oil terminal that was being replaced in Port Townsend stretched 233 feet (71 meters) onto state tidelands in Washington's Olympic Peninsula. The objective was to restore near-shore habitat functions, particularly for threatened fisheries resources, while accommodating the Northwest Maritime Center's need to moor vessels ranging from sea kayaks to historic tall ships, plus a future education center on the upland property. A key environmental goal was to reduce the fragmentation of eelgrass where shade from the existing dock had inhibited growth. Eelgrass beds are essential habitat for federally listed salmonids in the Pacific Northwest. They also create habitat and are a food source for Dungeness crab, Pacific herring, and other species. But eelgrass growth is often impaired by the construction and presence of docks and piers, as well as by physical disturbance, introduction of contaminants, increased turbidity, propeller scour from boat traffic, and light reduction. Site surveys and shade modeling of the dock area showed that the reduction of available light by the old structure was most likely to have caused reduction of the eelgrass bed. Clearly, an innovative design was necessary to meet environmental needs while allowing for construction of the replacement dock. After thorough study of the site conditions, the design team suggested extending the dock's footprint into deeper water and reorienting it relative to the sun's arc. These changes minimized the shading impact of the terminal platform on eelgrass growing closer to shore. As an added bonus, the dock now provides the deepest draft moorage on the city's waterfront. "We never would have thought to ask for more overwater coverage," said Dave Robison, executive director of the Northwest Maritime Center. "But the regulatory agency representatives saw the value in this creative solution and were willing to think out of the box." While the redesigned dock met permit requirements without environmental mitigation, the project went above and beyond with the goal of NEI. An experimental eelgrass restoration project was supported by the dock design team and funded by the NOAA Restoration Center. As soon as dock construction was completed, 50 community volunteers bundled a total of 5,040 eelgrass shoots donated by the Washington Department of Transportation, and PNNL divers planted the shoots under and around the new dock. An additional partnership with two local school districts has high-school students helping to monitor the transplants for three years. This restoration project has the potential to accelerate re-establishment of local eelgrass beds. Equally important, the innovative structure is serving as a "demonstration dock" for other Northwest coastal areas. In this role, it will be used to test the effectiveness of concepts and materials designed to encourage the growth of eelgrass. A new $20,000 grant from NOAA will allow for continued monitoring, including school-based educational studies and scientific studies by PNNL. The dock has received national and international awards, including an Engineering Excellence Award from the American Council of Engineering Companies of Washington, a Technology Merit Award from the Environmental Business Journal, and a Waterfront Center International Excellence on the Waterfront Award. That award's jury chair called the dock "a $1.5-million experiment -- a relatively small undertaking -- that has the potential to influence thinking and design elsewhere." Project architect Brian Court said: "Although ours was the smallest project to win an award, both in scale and in cost, the dock was applauded for being so tuned in to its ecological site. It sets a prototype for seamlessly integrating ecological concerns with design concerns."